What is SCK206 green thingy and where can I get it? my TV made a coughing noise , smoked a little and became yet another brick on the wall. Upon inspecting the power board I found a little green round thing next to the main power input with a solid hole in it and the letters SCK206 printed. I have some background in electronics, but I could not figure what this is. Capacitor is my first thought. SCK206 is a power thermistor used in the switching/activation circuits of a number of power boards, usually in plasma TVs (of course quite possibly elsewhere too, but in the context of TV repairs it is usually found in plasma TV boards as opposed to LCD TV power boards). It is often found in parallel to one (or the one) switching relays that activate when the power board is told to switch to full power by the main board. It is used as a temporary load balancing device that takes the current in case another power component has shorted and leads to overload. A failed SCK206 would typically mean power in a power FET or other power device has failed. As such replacing SCK-206 alone will hardly ever be sufficient. But if you still need it you can buy SCK206 here. TV changing channels or volume by itself, where is the problem? This article is about a not very common yet definitely annoying problem that can develop in any TV - LCD or plasma - and a basic troubleshooting guide to help narrow it down to a particular module. It was prompted by a recent experience followed by a user question that has just arrived. I had you service the Y-SUS board in my HP PL4260N and it works fine. I am having another problem with the TV now and was wandering if you have heard of it and if so how would I solve the problem. The tv will start changing channels on its own along with volume and flash the menu.I ruled out the remotes and covered the ir, disconnected all cables and it still does it. The described problem of random channel change or volume increase or volume decrease can happen on any TV and I have seen it happen on different kinds of TVs. There may be some that may be more prone to it - a common production defect is always capable of causing something like it - but I am not aware of any particular TV model where this is a known mass problem, including the HP PL4260N. The good news is that on all TVs the troubleshooting process is relatively similar and also relatively simple. The TV - be it LCD, plasma, LED, most likely projection TVs as well (although we don't do those) - can receive a command to change volume or channel in two major ways - the IR sensor or the on-unit navigation control, which in most TVs is in a form of several buttons. Both these sources travel , usually independently from each other, to the main board where they are processed by the TV's "brain", the main board's micro controller. 3) something on the main board itself; because of the way the IR and the buttons modules operate this is more likely to be something in the navigation button's circuit than the other one, but either way it would be something on the main board. To rule out the IR board you would want to just disconnect it from the main board. You can often do that at the plug on the IR board itself, but it is usually easier to just trace the cable from it to the main board and disconnect it there. You can power on the TV and disconnect it then or you can disconnect it and power on automatically. Either way you are trying to see if disconnecting the IR board will cause the volume or channel change to stop. You do the exact same to rule out the buttons navigation board. Disconnect and power on through remote (of course IR board will have to be connected) or power on and disconnect from the main board. If volume increase (or decrease) stops or channel flipping (or menu activation) stops, then it's something on the board or cable. Literally two weeks ago I saw for the first time in my life a volume up button which has failed and had a constant 50 ohm resistance, resulting in a constant "vol+" response from the TV. TV owners said they don't ever use the button which is believable since almost everyone these days uses a remote. And yet it has failed. At least once before I have seen the cable from the buttons panel to the main board get squeezed by and subsequently cut by the TV's bezel. I have also seen that same problem in other Chinese devices. Good companies - I think of Philips - design wire paths inside the body to prevent things like those from happening. Anyway, if you rule out both of those then the problem is in the main board. I have seen at least one case where a resistor has failed, near the buttons connector, and was causing the problem. Most if not all modern TVs do not have dedicated wire for each button on the panel; instead, they use an analog to digital converter on the main board to convert resistance to digital level. Buttons on the power board are simply resistors that get connected to a chassis; different buttons connect different resistance values, the main board converts that to a digital number and the main board maps a number to a function. Stands to reason that any significant impedance (resistance) change in the circuit will lead to misfire. Sometimes the problem may not necessarily be a resistor; it may be an active component, i.e. the ADC (analog to digital converter) itself. 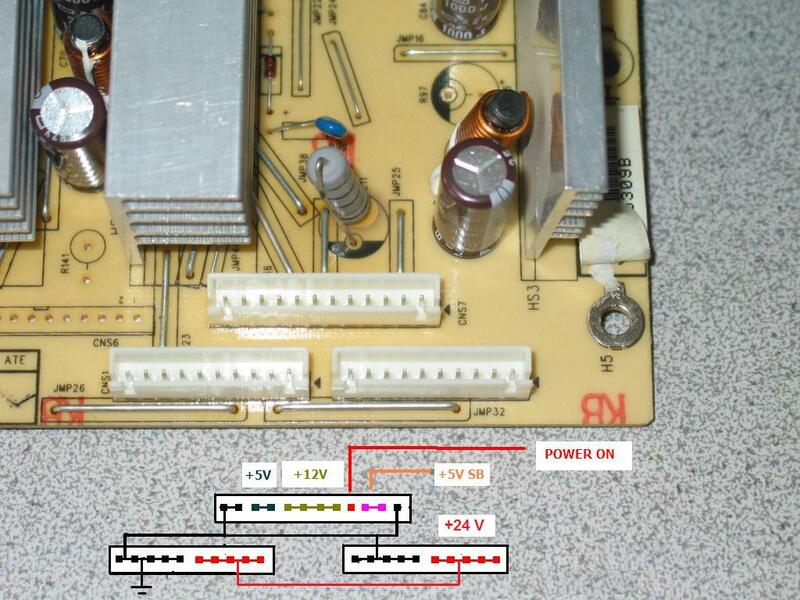 Troubleshooting the power board is beyond the scope of this article. 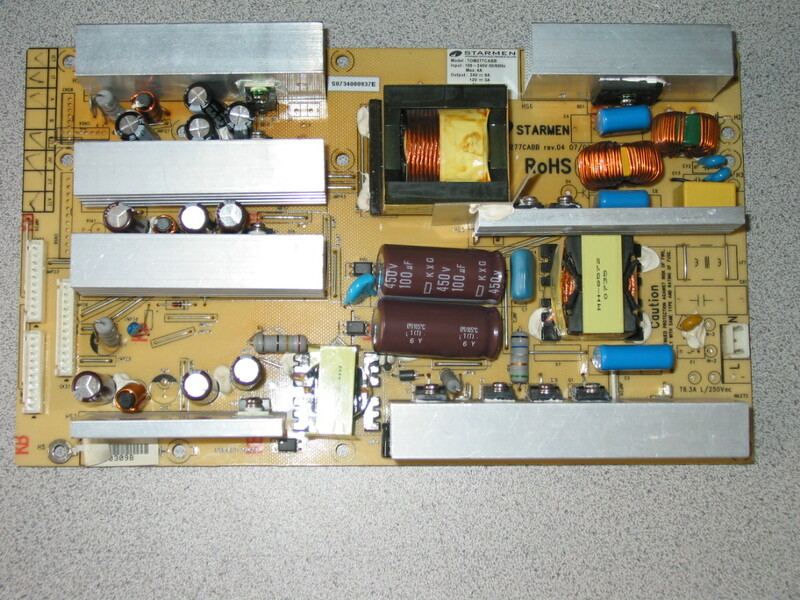 Synopsis: This article talks about how to test if your STARMEN TOM277CABB power board is bad and points to a repair service and exchange service , if available, in case you need them. A few days ago we were asked to repair a power board TOM277CABB made by STARMEN . It is used in a number of 42'' LCD TVs such as Digital Lifestyles FA2B-42570, LT42322, ARION AD-LC42F, SOYO MT-SYTPT4227AB and possibly others. Since Digital Lifestyles is now out of lifestyle and since it was a low end brand to start with (which doesn't necessarily means the TVs were of bad quality) there is no technical documentation available for it and that makes troubleshooting a bit harder. If you doubt that your power board is bad what you can do and should do is test it independently from the TV to see if it provides the standard standby power voltage (+5V SB) and then , if signaled by the main board, the rest of the voltages it is supposed to generate. All it takes is a simple voltmeter and knowledge where the output voltages are on the board. Upon connecting the board to AC the only output voltage it should generate is the +5V standby. Then, when those 5V standby are passed to a dedicated "power on" (wake up) pin the rest of the board activates and generates the 5V/4A, 12V/3A and 24V/9A powers as indicated on its label above the large transformer at the top (see picture). As you can see the lower two power connectors are only used for the back light inverters; they are connected in parallel and they only provide the +24V inverter power. The single connector above them is the one used to control the board and also provide power to the main board. The only power you should find on it when connecting the board to AC is the +5V SB voltage measured to any of the ground pins (I used the rightmost ones on any of the lower connectors for ground). And when you short those +5V to the POWER ON pin, which is extremely easy since it is right next to the +5V, the rest of the voltages should come up. Probably the most common issue with the board will be the failing electrolytic filter capacitors at the board's outputs (can be seen between the heat sinks at the left side of the board at the top picture - groups of 4,3 and another 3 capacitors). When those go bad they are usually easy to tell visually as their tops are bulging and sometimes leaking electrolyte; sometimes it may be the bottoms as well. The second issue we have seen on the board is a blown main fuse F1 caused by a failed/shorted transistor Q1; while we have not seen it at the time of this article, failure of such a transistor can sometimes take down other less powerful components as well, so be aware and check around as well. We offer DIY repair kits for STARMEN TOM277CABB and we may add or modify them over time as more information comes in and demand changes. Also, when available, we may be able to offer an exchange service for STARMEN TOM277CABB. Finally, if the matter is not just a swollen capacitor, you may consider using our TOM277CABB repair service. 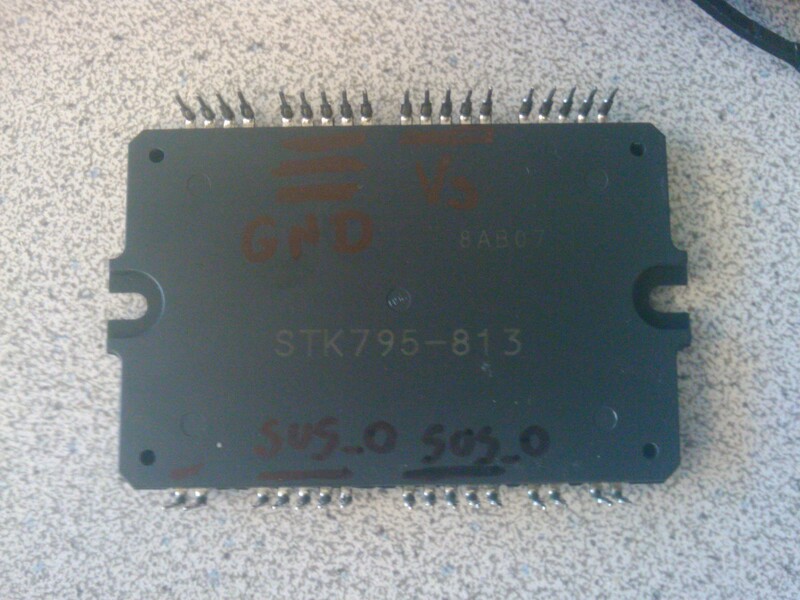 Half the STK795-813 ICs we received the last time from our vendor were defective. Here's a short note I just wrote to them asking them to please save time and money and test the ICs before they send them in future. This will also be of great help to all other US "vendors" who are not competent enough to do it on their own, which is probably the majority. No offense meant, that's what I see and hear from customers. The test is not complete, meaning an IC may pass it and still be bad, but that will be one in a few hundred in our experience. It's a quick, simple and easy test which easily takes care of the most common failures. BTW you can also buy STK795-813 - already tested! - at our store, for as long as supplies last. Testing is similar to the way you test the STK795-518, only the legs are different. The testing device will still be in “diode” mode where if you touch the two probes it will beep to indicate short circuit. In the test you will be touching different pins of the IC, not the two probes of the device. But before starting you make sure the device is properly set up by touching the two probes for a moment. The device should beep. You will make 3 tests on each IC. If any of them results in continuous beep and reading of “0” (or the same reading on the display as you get when you touch the two probes of the meter and hear beep) then the IC is bad. Each of the contacts (VS, GND and SUS_O) has multiple pins on the IC, i.e. all pins in the group are the same and it does not matter which one you will try on. I do not know if the ICs I sent back have already arrived, but you can practice on them – all of them have at least one of those three combinations shorted. A good deal - I guesstimate anywhere from 10% to 20% - from our support calls start with something that can be summarized this way: "My TV stopped working and I need to know if you have power board for it, becuase that's what is bad, right?" Internet posts from DIY experts and self-promoting TV technichians add a great deal of confusion to almost any failure since almost everyone who was successful at their first DIY repair tends to assume this is a common problem for the TV and describes both the symptoms and the solution with the capacity of an experienced technicians who has seen and done it all. Which is hardly ever close to the truth in the big picture of common failures and the various post-failure symptoms they cause. In this article I will review a few popular misconceptions that we at Coppell TV Repair are encountering pretty much on a daily basis. As said earlier this is the most common confusion we are seeing among first time callers. They often cite Internet as a source for their self-diagnostic and at least half the time they are wrong. I have personally seen and corrected many posts at Fixya where someone considering themselves an expert - or simply someone willing to help without realizing they're doing exactly the opposite - authoratively advises someone with a question that the problem is in their power board. Sometimes they may be right, of course. But very often they wouldn't. The first and most important piece of information is always the specific TV model as the issue is first and foremost specific to a particular board in that model. Next , at least for me, is the display technology as it has a great impact over the architecture and risks associated with the power board. Plasma TVs, for example, have more powerful and more complex power boards, which feature more protection mechanisms; in addition, plasma TVs are prone to failures in other modules - specifically the sustain boards - which are, in a way, also power boards fed from the main power board and a TV would often refuse to start if a sustain board has failed and shorted. Moral: Do not assume what's wrong with the TV just because someone said so, unless you know that someone is good at what they say. 2) If TV doesn't work replace the capacitors! That's probably the second most widesread myth about failures. Oh yes - bad capacitors can cause tons of problems. In certain modes and batches of those models. They'll be OK on others and they will be the last issue to develop on many many other TVs. For example the infamous Dell W4201C has an issue with two capacitors in the power board, but only in some TVs; in others, different capacitors were used and the power boards go for years and years, giving way to the guaranteed problem with the failing buffers and Y-Main board. Or say the Sanyo DP46819 or Sanyo DP52449 and others Sanyos from the same family...the main board is way more likely to develop a problem than the power board and it won't be capacitors either. Being still popular, the capacitors replacement business have created companies offering just a bag with all electrolytic capacitors from a certain board and proudly labeling it "repair kit". I've seen a few such listings on eBay, for example this one and this one, which are funny, because they offer to resolve a problem, which practically does not exist. Power board BN44-00161A has a high failure ratio and to my amusement there was a popular vendor on eBay who was selling for a long time a "repair kit" of 2 capacitors and 4 FETs, a combination which I have never, in hundreds of repaired boards, seen needed together, but definitely falling short of covering the most common failure on that board. It took them two years before they started selling the right kit! I don't know why people have that idea. When I asked a few times I got "well somehow I just thought so". Plasma TVs have gas in their displays and gas, being intert, does not care if it is horizontally or vertically oriented in space. You can do keep or service your plasma any way you want. One of the benefits of servicing it horizontally is that it's harder to lose a metal bolt or screw down the boards. Moral: If you lose a screw between the boards turn your plasma upside down and shake hard until you get your stuff back on the floor. It's fun! Well that one is kind of true...sometimes. It really depends on the board and the failure it gets. Some boards - particularily plasma TV buffer boards and sustain boards - are known to age with time, in fact fairly fast - 3,4,5 years...and they just fail at the end. When a chop-shop like ShopJimmy , DiscountMerchant or any other one really, buys tons of liquidated TVs, take the boards out and sells them, they have no way of knowng how long did those boards work before getting to them. Frankly, I dare say most of them do not know (or have not been knowing for a very long time) that the parts they were selling were fast disposables and having arrived from a used TV they have a very short life. Of course for many other cases chop-shops are not only useful, but often only available alternative. Moral: New is always best and sometimes repaired is definitely better than used. Again, it depends a great deal. Some boards you can only buy from that particular brand. More often than not, though, you can buy the same board from a completely different brand of a TV and use it at 100%. This is particularily true for plasma TVs where there are several major plasma display technology, which develop practically the whole plasma-related part of the television - specifically the display and the boards that make it show picture - and license it to the rest, who use their own main boards, menus, internet connection etc. stuff that is secondary to the display itself. As of 2012 easily 90% of all plasma TVs in USA - that's over 50 brands - are made by only 3 companies: LG, Samsung and Panasonic. Fuji and Hitachi have some market, but I don't think it is of significance (except for people needing Hitachi buffer boards I guess). Which mean that the plasma display and sustain boards in HP PL4260N are practically the same as the display and sustain boards in Viore PDP42V18HA. They work the same, fail the same and can be serviced the same. Oh sure, HP is giving the boards different name so that customers get back and buy the same boards from HP - usually for more - but it's still the same board. Moral: Do not buy from Viore unless you know what you're doing. HP has the same LG BS, but at least it gives you the impression of a higher quality.